XBox Kinect brings games and entertainment to life in extraordinary new ways, with full body play. Arms, legs, feet, and hands, with Kinect there are no controllers, just you. It’s so natural, so intuitive that technology evaporates, letting the natural magic in all of us shine through. All you need to do is jump in! You can add the new sensor bar to any Xbox 360 or purchase the whole console. 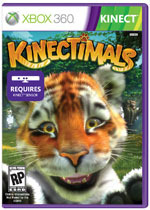 One of the first new games for the system is Kinectimals, where you can meet your new best friend! Embark on a journey across the mysterious island of Lemuria and build a heart-warming bond with the world's most adorable cubs. 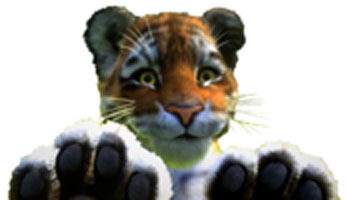 Your can adopt and name one of 5 exotic creatures, including a Lion, Royal Bengal Tiger, Cheetah, Leopard, and Black Panther. Use your voice and body to teach your cub new tricks, discover the island's many secrets and build a bond that grows every time you play. You can teach your pet how to fetch, play sports like beach volleyball, respond to commands by the sound of your voice and play hide and seek. Your pet will also love being pet and their tummy being rubbed and their ears scratched - they'll even purr!